Genie continues to beef up its Super Boom product family with the announcement that the new Genie® SX-150 telescopic boom lift is set to hit the market very soon. Offering uncompromising productivity, reliability and serviceability, this boom lift provides industry-leading capacity with a full working envelope. The new SX-150 boom lift is a great fit for construction, maintenance, telecommunications, gas and oil refineries, chemical maintenance, and large utility applications. Offering excellent productivity benefits, the SX-150 boom lift reaches its full platform height of 46.33 m (152 ft) in under three minutes. The boom offers four programmable height settings of 45.72 m (150 ft), 41.15 m (135 ft), 36.58 m (120 ft) and 30.48 m (100 ft) for rental versatility, and a 3.05 m (10 ft) horizontal and vertical rotating jib allows for quick local repositioning of the platform. With a horizontal outreach of 24.38 m (80 ft), this boom also offers 21.34 m (70 ft) of outreach at 36.58 m (120 ft) of platform height. The SX-150 boom lift provides unrestricted range of motion with a lift capacity of 340 kg (750 lbs) for a maximum of two people. The boom uses an identical, field-proven chassis design as employed on the SX-180 and ZX-135 boom lifts. External sensors and manifolds are protected under steel covers that are easily removed providing excellent service access. The unit uses a Deutz® Tier 4 interim engine. The rotating jib worm drive reduces backlash while increasing reliability and offers 60 degrees of horizontal motion for increased working area. The SX-150 boom lift contains hydraulic hard lines wherever possible to increase durability while a hydraulic filtration system ensures cleanliness. 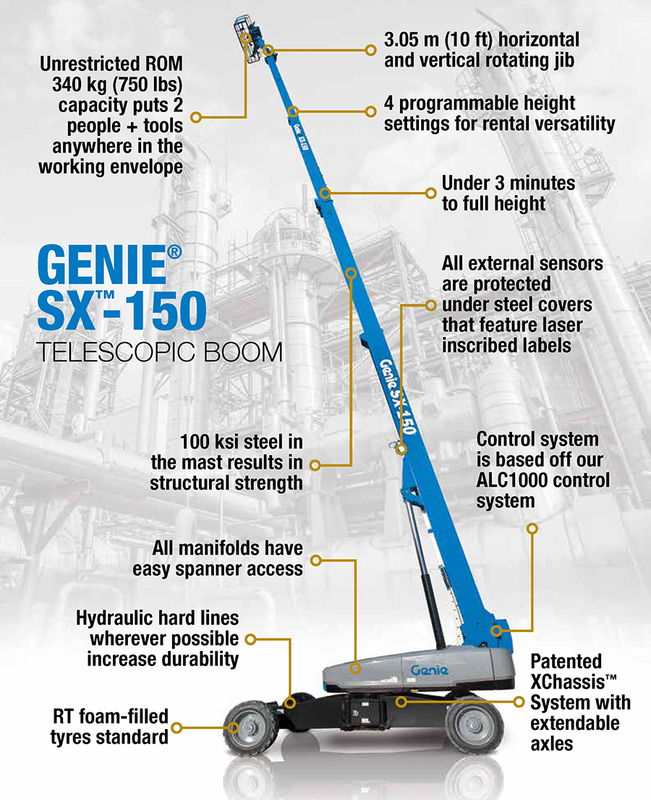 “Genie® products are known for their serviceability, and the SX-150 boom lift is no exception. This product was designed with the service technician in mind,” said Lawrence. The Genie SX-150 boom lift will be available in Australia by the end of Q1 2016. Call your local sales representative for more information.